Play this fun 4th Grade Vocabulary Game to review important math words using definitions, images, and examples. How many points can you make? You will have only 60 seconds for each definition to figure out the correct answer. This vocabulary game provides students with an opportunity to discover math terms in different contexts and receive immediate feedback after each attempt. The game can be played on computers, iPads, and other tablets. You do not need to install an app to play this game on the iPad. 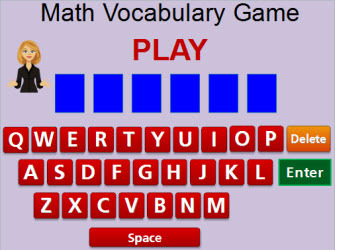 To play other exciting math vocabulary games, please visit this link. Return from the 4th Grade Vocabulary Game to the 4th Grade Math Games webpage, or to Math Play.